Chic and lightness have no limitations for Monique Lhuillier and this fashion designer doesn’t stop demonstrating it over and over again. 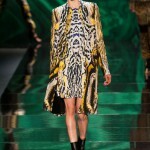 This year she had the catwalk painted in the emerald green for the New York Fashion Week show, which hosted the range of the stunning evening gowns and cocktail dresses. 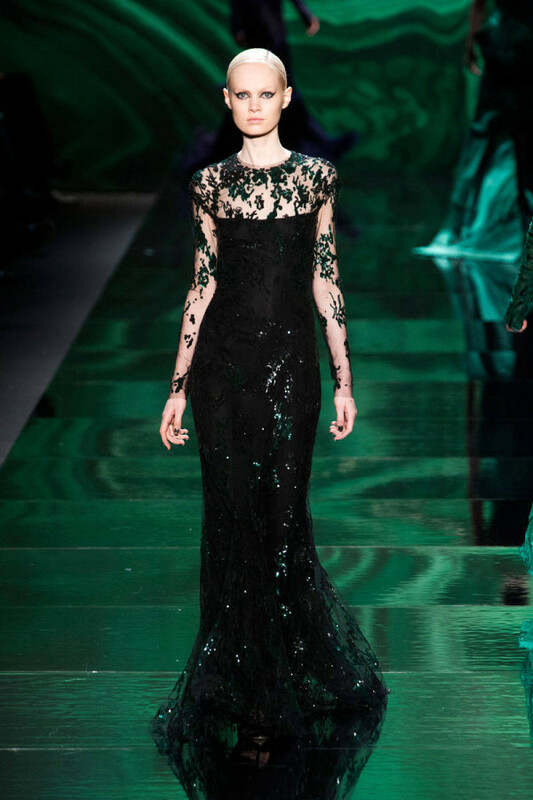 The Monique Lhuillier fall winter 2013-2014 collection is classy, dusty, rich and extremely feminine and has a lot of stunners, so we can ensure that the Monique Lhuillier dresses will appear on the Oscars red carpet that will take place on February 24. The Monique Lhuillier fall winter 2013-2014 show started with the range of the snow white knitwear, so everyone could hardly guess the show is continued with the richly jeweled dresses in the bold tones. Malachite greens, hot reds, purples, burgundy, black and gold shades made everyone’s jaws drop. 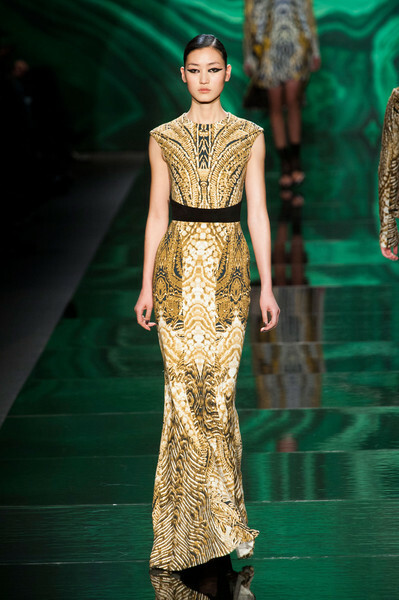 Malachite green became the key hue of the collection and that’s happened for the reason. 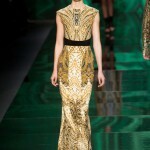 It all started when she I looking at her malachite dress. I was like, ‘Oh my gosh, I have to put this in the collection!’ Then I decided to paint the [runway] backdrop that color because it feels so opulent and so inviting. And I wanted to build on that, so I added more jewel tones for the evening portion and, of course, black—because who doesn’t want to wear black in the fall? Then I wanted to create the absence of color in the beginning of the show, which is why I did all those winter whites. Gown from this Monique Lhuillier fall winter 2013-2014 collection feature the fur detailing, feathers, amazing embroidery, exquisite fabrics and lace. The hybrids of the cigarette pant-gown with tulle detailing were a brand’s innovation, while the malachite green lacy dresses served as the ideal alternatives to the floor-length evening gowns. 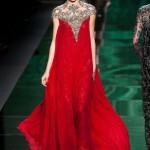 My absolute favorite was the amazing red flowing gown with the sophisticated silver embellishment on the upper part. 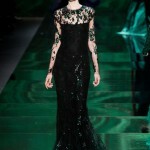 The malachite green sleeveless gown with the ombre effect in the black hue was also the collection’s spotlight. Apart from the fascinating evening gowns, the Monique Lhuillier fall winter 2013-2014 collection also includes the less formal garments like the womanly dresses, draped blouses and printed coats. Where can I buy this flowing res evening gown. It is so beautiful.